Article first published as Book Review: ‘If Truth Be Told: A Monk’s Memoir’ by Om Swami on Blogcritics. “If Truth Be Told: A Monk’s Memoir” by Om Swami is a remarkable story following his journey of renunciation and awakening. Om Swami’s mother had a vision that let her know her son had a destiny that was unlike most. Not being comfortable with this revelation, she initially chose to keep it to herself. As Om Swami grew up and he felt his calling, it was obvious that his destiny was set in place, even without his mother’s information. As a child, he had a vision that made him determined to continue his spiritual path. He sought out people who could teach him meditation, astrology, and Tantra. When he reached the age of 18, he set off to Australia to work in higher education. He had very little money; however, he worked his way up and eventually created his own multi-million-dollar company. The whole time that he was doing this, he knew that the day would come where he would pursue renunciation and live the life of a holy man. After achieving tremendous success in the business world and the chance to travel to many countries, the day came for Om Swami to give up everything. He sought out masters who could teach him about the path he was meant to follow. He was unique in that he had left behind great wealth to do this. Many of his attempts at finding a teacher, ended up with him meeting angry, disillusioned souls who appeared to have ended up on their path without choice. These people taught Om Swami about what he did not want to be as a teacher. These were lessons well learned, however, the time also kept him from the experience with the divine, that he was desperately seeking. In time, Om Swami was able to take the knowledge he gained from others and go off on a long meditative retreat. Some of his adventures brought him to the edge of death. At times, he almost starved to death, other times he almost froze. Om Swami’s experiences took him to the ultimate level of self-realization. After he achieved this, he was able to return to his family to decide how he was going to continue on this path of awakening. “If Truth Be Told: A Monk’s Memoir” is an incredible story that hold a tremendous amount of wisdom within its pages. As Om Swami reflects on his experiences, the reader learns from him. Since the path of renunciation is not a reasonable option for everyone, readers will appreciate the chance to learn from his story. For me, this book really opened my eyes and answered many questions that I have been holding within. During this time I was reading this book, I took the opportunity to meditate at the meditation gardens at the Fellowship of Self-Realization in Encinitas, CA. The message I received during my meditation was that I needed to let go of what was holding me down. This was a very powerful message for me and I look forward to reading more of Om Swami’s works so that I can gain more clarity on what I need to do. 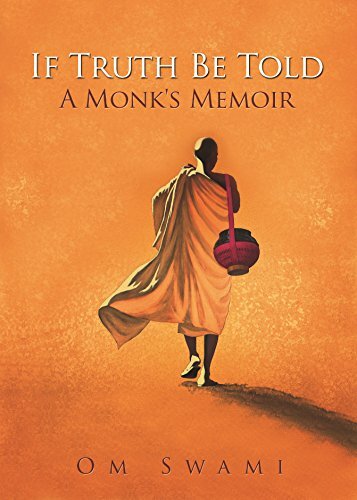 I highly recommend “If Truth Be Told: A Monk’s Memoir” by Om Swami to people who are seeking enlightenment, and especially to those who have felt let down by false or poor teachers. This is a must-read!